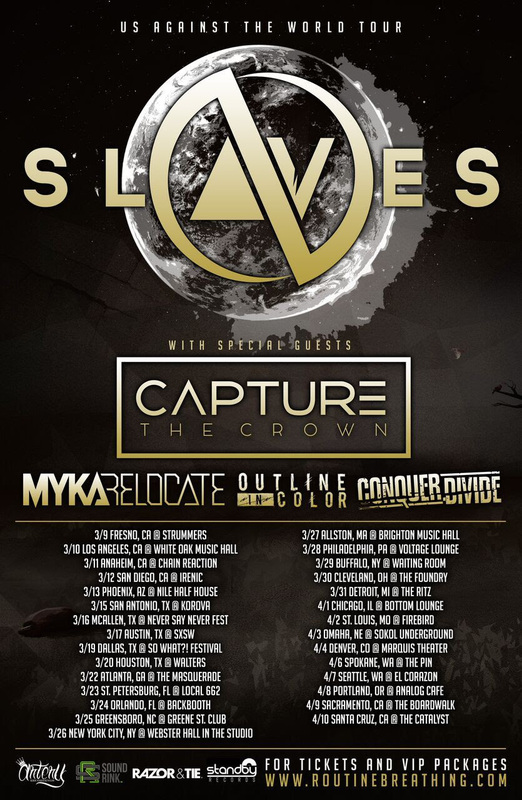 Outline In Color Touring with Slaves, Capture The Crown, Myka Relocate and Conquer Divide This Spring; Band To Release New LP in March – Ouch That Hertz! Tulsa, OK’s Outline In Color have been announced as one of the three supporting acts on Slaves’ upcoming ‘Us Against The World Tour.’ Joining them are Capture The Crown, Myka Relocate and Conquer Divide. Dates run March 9-April 10. Get the complete list of dates below! VIP tickets are on sale now at www.routinebreathing.com with general admission tickets on sale starting January 8, 2016 @ 10:00 am PST / 1:00 pm EST. 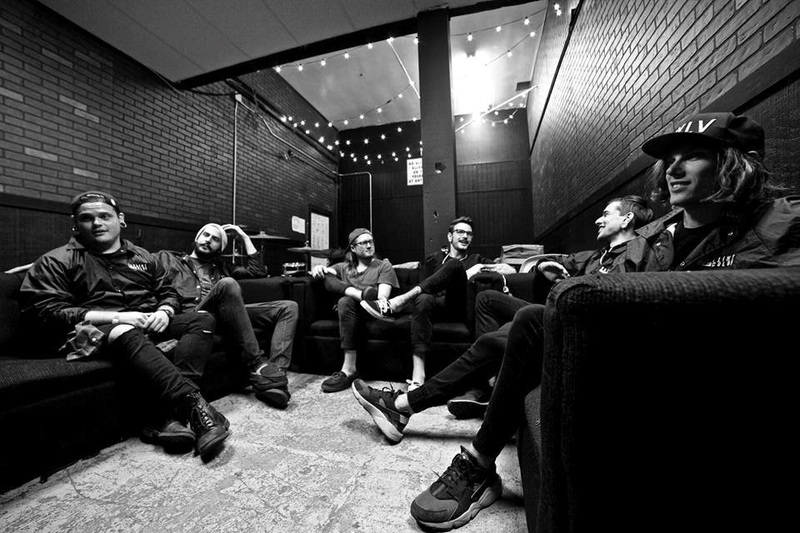 Outline In Color will follow up their 2014 sophomore full-length, MASKS (which peaked at #11 on the iTunes rock chart) with a new LP that is expected to be released on March 11 via Standby Records. Pre-orders will launch in February. For so many of today’s youth, they are forced to live in a world where they can’t simply express who they are, who they want to be, or the direction they plan to go into to get there. For so many, the “norms” of life force them into hiding where they are left feeling beaten down, bullied and downtrodden by society. For this unfortunate majority, the real person in them stays locked away behind a series of MASKS which inhibits them from enjoying the riches life provides. For Tulsa, Oklahoma’s Outline In Color, the time is now to let their heartfelt emotions out through their musical power. For Outline In Color, the time is now to shed their MASKS. That pushing of the limits has paid immediate and noticeable dividends. Listening to MASKS, you hear an amazing amount of growth from each member of the band. Guitarists Forrest Mankins and CJ Cochran have quickly developed into one of the most formidable guitar duos throughout the entire metalcore landscape. They rage wildly over the intensely thick and stable foundation created by the rhythm section comprised of bassist Michael Skaggs and drummer Austin Mcferrin. Throughout it all, the tag teaming of clean vocals from Simonsen combined with the screaming rage spit forth by Trevor Tatro makes Outline In Color one of the most easily identifiable bands on the scene today. For now, Outline In Color are ready to take their band to the next level with MASKS. Armed with the backing of Standby Records, MASKS is set to prove that you don’t have to do anything in a standard fashion to exceed expectations placed on you by those that can’t think outside of the proverbial box. “I don’t think that we have ever once gone about things in a conventional manner. We’ve never recorded an album with a producer, or anything like that. Hell, we even started a merch printing company so that we could print our own tour merch. Which we still do to this day,” Simonsen concludes. “We learned how to do it ourselves”.